With the tram type R2.2b you can take a virtual tour through downtown Munich and explore the routes of the lines 12, 27 and 28! Experience for yourself how it feels to take the tram through the Bavarian capital. The tram has a long tradition in Munich, the first tram line opened in 1876. But our simulation doesn't lead you that far back, because instead of the R2.2b there was still a horse-drawn tram on the way. About 120 years later, since the mid-1990s, the vehicles of the R2.2 series have dominated the Munich cityscape. The type R2.2b was comprehensively modernized from 2011 and is currently in use on Munich's rails in its redesign. 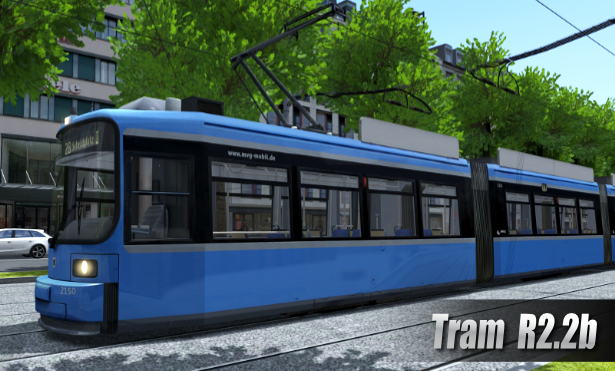 And exactly with this vehicle in the well-known blue design of the MVG you can become tram drivers yourself! Put your skills to the test - get into the driver's seat and you're ready to go! Route 12 runs from Scheidplatz via Kurfürstenplatz to Romanplatz and is a link in the Munich network. The journey time for the 16 stops in each direction is 21 minutes. The route also includes a very important operational loop for distractions and short tours: The Ackermann/Olympic Loop. This will also be included in the simulation and used with corresponding scenarios. Route 27 runs in the heart of Munich from Sendlinger Tor via Karlsplatz, Karolinienplatz, Kurfürstenplatz and Hohenzollernplatz to Petuelring. The journey time for the 15 stops along the line is about 20 minutes. Past many famous sights, such as the Pinakotheken or the old Börse, time passes in a flash. Line 27 is not only in use during the day, but also at night. Test your driving skills in night traffic as well! Route 28 also starts at Sendlinger Tor and runs via Karlsplatz and Karolinienplatz to Kurfürstenplatz. There, line 28 branches off from the shared route with line 27 and continues to Scheidplatz. The journey time for the 12 stops along the line is about 16 minutes. Try it out! Become a tram driver yourself and drive through Munich on our lines. Type R2.2b belongs to the R series, MVG's first low-floor tramway. After around 15 years in service, the R2.2 one-way vehicles were extensively modernised and went into operation in 2011 as the R2.2b series. Both inside and outside, the modernised model is available in a new design - blue and white aluminium. New handrails, extended passenger information and swivelling sliding doors characterise the redesign.